With nearly 400 stores across five countries, we're a one-stop source for domestic, international, and freight shipping services. When you visit your local Pak Mail in El Dorado Hills, we'll find the most cost-effective, safe way to pack and ship your items, whether it's by air, ocean, or ground. 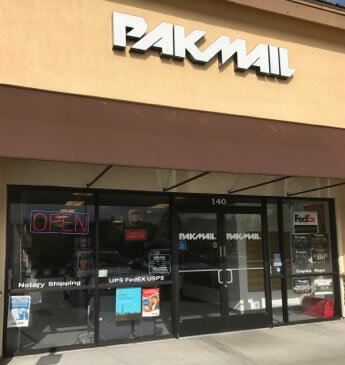 WELCOME TO PAK MAIL EL DORADO HILLS! WE ARE YOUR LOCAL COMMUNIY BASED MAILING/SHIPPING CENTER. Pak Mail El Dorado Hills is the most complete packing and mailing/shipping business you will ever use. Looking for the best value for small package shipping? We help our customers do everything from sticking a stamp on a letter, to packing and shipping delicate crystal, to crating heavy machinery for domestic or international shipping. The Krakow family has owned and operated our center since 2003. We raised our kids here and love being a part of our El Dorado Hills community. We support our local schools, Boy Scouts and Girl Scouts. We offer a wide variety of services. For mailing and shipping we compare options and pricing for USPS, UPS, and FedEx. For large and/or heavy items we also offer freight services to help you determine your best option. We ship via common carriers, moving services and small regional carriers. We offer copy and fax services. We rent private mailboxes with a prestigious street address. We offer Notary Public and Live Scan Fingerprinting. Need to get a great greeting card or office supplies? Need to make a house key? Let us be your one stop, fast, friendly, convenient neighborhood store.